…This is a third study on a flag for unity in New Zealand (Aotearoatanga), which could also double as a republican flag. 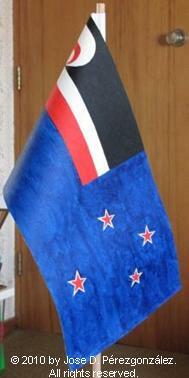 The flag is based on both the actual flag of New Zealand and the Tino Rangatiratanga flag. In a drastic swap, the Tino Rangatiratanga flag displaces the Union flag in the canton of New Zealand's national flag, everything else remaining the same. …This flag is overtly "republican". The meaning of the flag, if one is needed, is, thus, the unity of a republican country with a historical "dual" settlement: the indigenous people, the Māori, represented by the Tino Rangatiratanga flag, and the people who came after them, the Pakeha, which brought territorial and political unity, and peace. The Southern Cross represents the location of New Zealand in the Southern Hemisphere. …This design is overtly republican in the sense that the Māori emblem has displaced the colonial one in a way which is obvious and unmistakable. It doesn't necessarily make for a satisfying flag, but its political connotations are quite obvious.